Compare my photo to the one at Thug Kitchen, and you will laugh. I recently found out about Thug Kitchen and couldn’t be more thrilled with a vegan recipe blog that simultaneously enriches my life with its wonderful teachings on not being an idiot about what you eat. I highly recommend you go over there and check things out. If I swore as much on this blog as I do in real life, it would probably be close to what’s over at TK. Thug Kitchen was recently nominated for Saveur’s Food Blog Awards as Best New Blog. Head over there and check things out, lots of blogs way better than this one are nominated! ¼ cup vegetable broth or water (I used chicken broth, oops)! Put all the ingredients for the pesto in a food processor and blend until desired smoothness/chunkiness. You can dice everything if you don’t have a blender or food processor. This recipe makes about 1 cup of pesto. You can mix the pesto with about 1 or 2 15 oz cans of black beans. 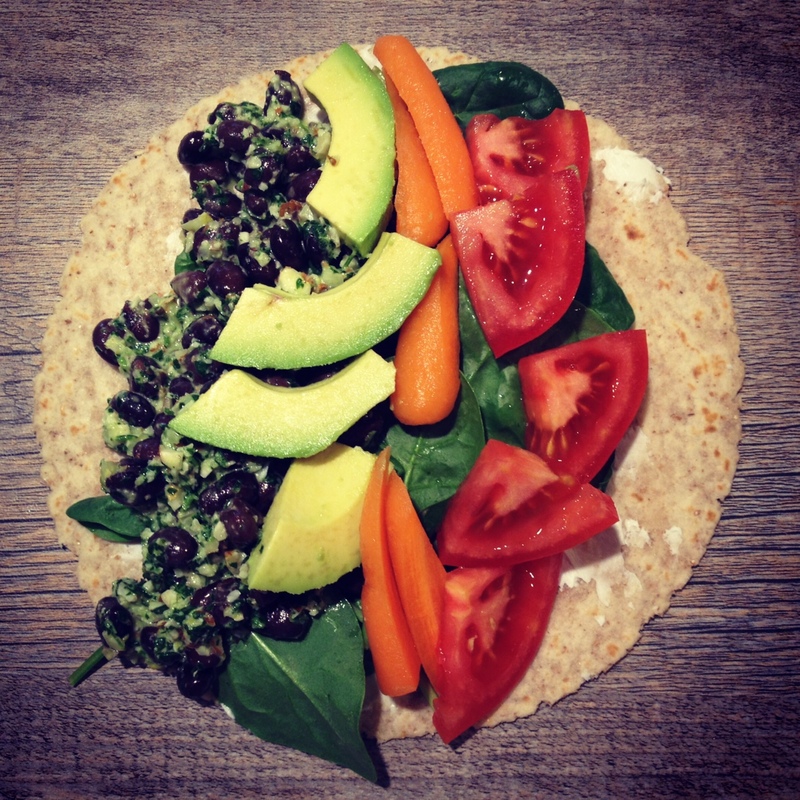 Mix the beans together with the pesto and wrap it up with whatever vegetables you like: I took a whole wheat tortilla and added a little cream cheese (sorry vegans), spinach, tomatoes, carrots, and avocado. Other tasty options include cucumbers, red onion, lettuce, corn, salsa, black olives, lime juice. The black bean pesto makes for an excellent next day lunch: I just mixed the leftover pesto with tomatoes, bell peppers, and then added fresh sliced avocado on top before diving in. Yum!